TORONTO, September 14, 2018 – On Saturday at Woodbine, much of the focus will be on the $800,000 Ricoh Woodbine Mile which offers Breeders’ Cup Win & You’re In status to the winner. However, the 12th and final race on Saturday’s card will be a lucrative opportunity for horseplayers with a MANDATORY payout on offer in the JackPot Hi-5 which currently boasts a carryover of $631,143.79. Emily Gullikson, a partner in OptixEQ and a contributor to the OptixNotes team, has provided a full field analysis of the JackPot Hi-5 race below. #1 AGOSTA (12-1/KEY) four-year-old filly is making her third start off the short layoff and comes into this race with slightly better form that initially looks on paper. Going back to July 27th race, her first start of this form cycle she had some early trouble taking up and got shuffled out of her early position. That issue became a little more dramatic from the inside and potentially cost her a better position. Last out she drew the far outside on the turf and while trying to get to her forwardly placed tactical position was caught wide and unable to overcome the post. Off both of those starts she will take a drop in class, which look logical and is a return to a class level she ran well at back in April of this year. Wilson stays aboard this filly and she has been aboard her many times in her career. #2 SKY VISION (12-1/SPREAD) she is tough to endorse off her last two starts which coincide with the trainer change to Desruisseaux from her race back in the middle of July. 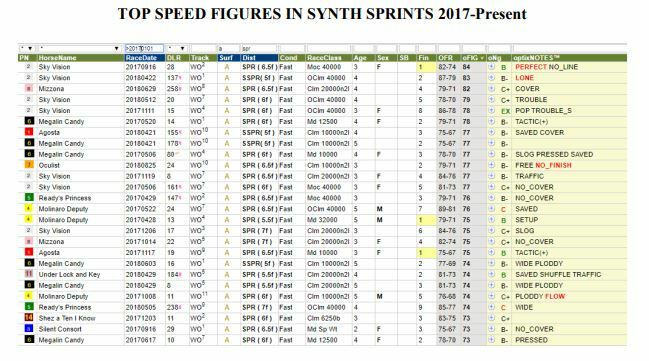 Her best races from speed figure standpoint have come on the turf, and best synthetic races occurred with perfect or lone trips. Tough to see that scenario in this full field. The class drop is noticeable and she does have races that fit within the speed figure range if able to get back into form. #3 SILENT CONSORT (10-1/SPREAD) she will be facing winners for the first time after breaking her maiden with a perfect trip in the eleventh career start. She added the blinkers last out and even with the win do not think they played that much of a role as her speed figure remained the same. This is a big class jump and her speed figures are below for this field; considering she has not improved in that department throughout her career, she has to step up today. #4 MOLINARO DEPUTY (8-1/BOARD) she comes into this race off a “better than looked” second place finish last out. She looks in form coming into this race and should give a similar type competitive effort. Contreras stays aboard which is certainly a positive. On speed figures and class she is pretty common. She is less of a win candidate, needing ideal to get the win, but looks very logical to hit the board. #5 READY’S PRINCESS (20-1/BELOW) her speed figures are on the softer side and distance is a little short for her based on what she has shown in the past. At this six furlong distance her run style is more of a deep closer. Considering this is a full field she will have a lot to do late; and really have to negotiate through that full field of rivals. #6 MEGALIN CANDY (6-1/ABOVE) she projects to be one of the pacesetters and perhaps the best of the speed. She will have some contention up front, still has shown she can run competitively on the front end at this distance, level, and surface. She is a must use, although given her 0/20 record there are concerns even though she has run well over this track. move forward with her and her current numbers keep her in the mix but not one that overwhelmingly stands out. #8 MIZZONA (3-1/KEY/ABOVE) she looks well spotted in here for Steve Attard and should appreciate the class drop entering this race with good form. She raced competitively last out with less than ideal traffic trip. She ran a winning race over the turf back on July 13th as part of a blanket finish on the wire. She should find an ideal stalking trip today has enough tactical speed to get position and enough kick late. Kimura will jump back aboard today and he has really impressed this meet. He has been aboard her in the past and will get the slight weight break to help as well. #9 EARLY RINGALING (20-1/TOSS) she lacks a single race that makes her competitive on class and speed figures. #10 SCARLET BOW (20-1/VALUE) she needs to move forward in here to be competitive but has a couple factors to think that is possible. This is her third start of the form cycle and her OptixFIGs (speed figures) have improved start to start. She was in against slightly higher level claiming rivals in her last two starts. In each of those last two races she was forced to race wide slightly against the flow, with early position close up to fast paces for the distance. She has races in her career that fit with this field and looks to be sitting on one of those better efforts. She should be a bigger price in here and should be used for value. #11 UNDER LOCK AND KEY (20-1/TOSS) she has been off form since being claimed back in June. From a trip perspective she looks compromised with run style and post. To run her best she needs the lead. The outside post does her no favors with horses with similar run styles drawn both inside and outside of her. In addition she has a tendency to break slow and therefore will have to rush into the race using extra energy early, not able to save much for late. #12 BELLA’S STORM (20-1/VALUE) granted would have liked to have seen more from her last out but given the distance, race shape, and track profile she did not have much of a chance to get into the race. She looks to get a much more favorable trip today and can help her rebound in this second start in $10K claiming level. The additional furlong looks helpful today; and to her credit has that win over the track and distance which many in here lack. She has worked twice since the last race, both decent works to prepare for this race. #13 ALERT KITTEN (20-1/BELOW) she has some early speed and is cutting back in distance which can make for a tricky trip from this outside post. She was showing some early speed on the turf in higher claiming races. She does seem to lack finish and current form is questionable. Tough to see her used as a main contender though could see including underneath at a big price. #14 SHEZ A TEN I KNOW (20-1/UNDERNEATH) she is tough to make a case for given current form and this far outside post. Most of her recent races she has been forwardly placed and still struggled late. She is borderline toss in here based on trip but is ploddy enough to perhaps stick around in those deeper exotic spots. AE #15 IGOTYURGRASSHOPPER (20-1/TOSS) she is coming off of a long layoff and will be making her first start at Woodbine and over a synthetic course. Her run style given this post and fitness is problematic. She has a couple races in her form that are encouraging overall, both occurred second off the layoff and sprinting on the turf. This entry was posted in Woodbine Insider and tagged Emily Gullikson, Horse Racing, Jackpot Hi-5, Wagering, Woodbine. Bookmark the permalink.